More photos from the shop - here. I had the privilege to visit Classic Cycle on Bainbridge Island in Washington state. The shop is large, but as the owner, Paul mentioned, there is only room for 50 bikes along the top portion of the walls in the shop. Fifty isn't anything to sneeze at, but their collection is quite a bit bigger and they can all be seen on their website, here. No sense going into details, as the photos do the talking. You can find my pics here. Honestly, I didn't even look at the modern bicycle offerings in the store, but judging by the well-stocked shelves, terrific merchandising, and overall friendliness of the employees, I'm sure that Classic Cycle will have anything you need and deliver it in style. 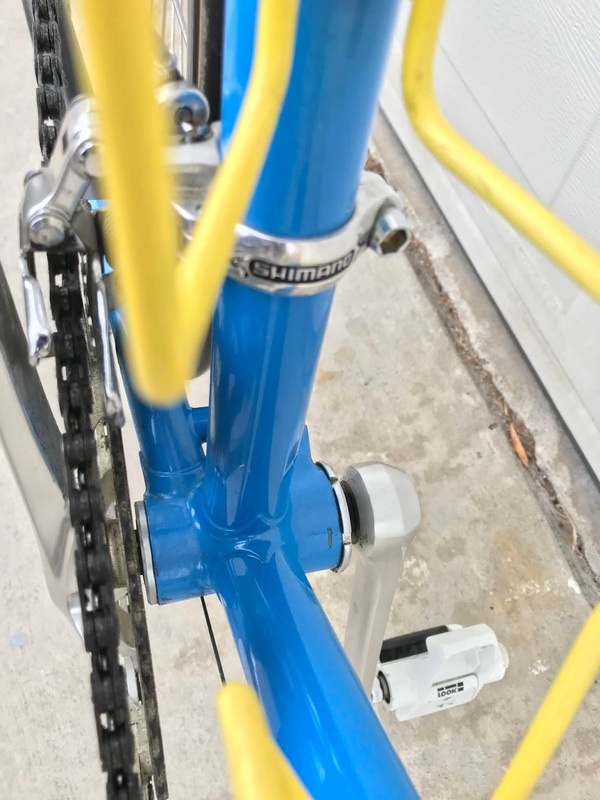 Schwinn Paramount with full Campagnolo. 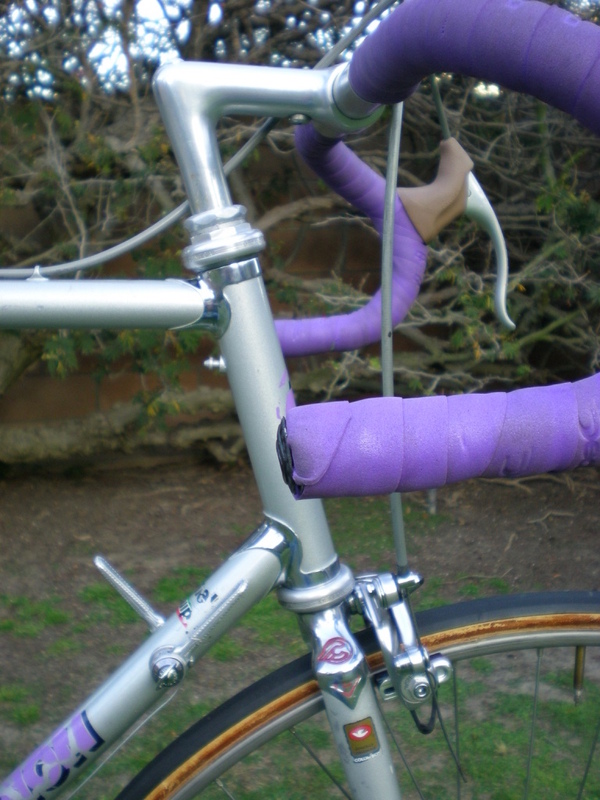 This curved seat tube (short-coupled) model was available in 1975 - 1978. Built for criterium races or for riders who wanted the quicker handling that a shorter wheelbase provides, these are more rare than the standard models form this era. The vendor selling this Paramount asked $1,200, but was willing to accept offers. I have a rule that I don't collect bikes that don't fit me, plus this one isn't on my list of "must-haves" so I passed on it. This swap meet is held monthly at Veteran's Stadium in Long Beach, California. This is primarily a motorcycle swap, but there are about two dozen bicycle vendors, as well. The majority of the bicycle spaces are filled with balloon tire or BMX bikes. I was hoping for vintage steel racing bicycles, but there were very few - not worth the $10 admission price for the swap, but no regrets... had to check it out and it was nice to stroll around hoping to find some deals. If you love motorcycles, this swap is for YOU. Here's the website for it. Enjoy! 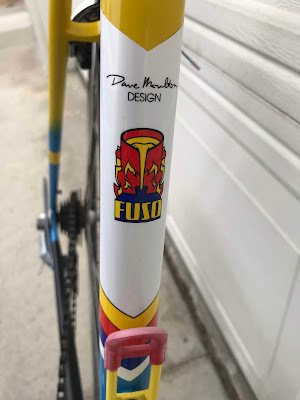 Bought this Fuso from the original owner. 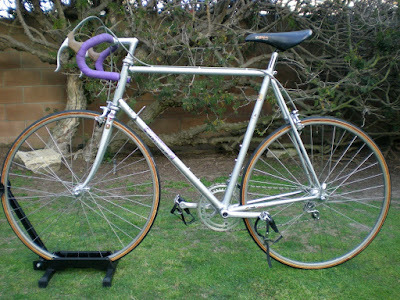 This is all-original, no part substitution except the bottom bracket. The owner installed a sealed BB about 20 years ago. It's in immaculate condition - even the bar wrap is original and in great shape. You can find a lot of great information on Dave Moulton's frames, his life, his achievements, on his blog HERE. 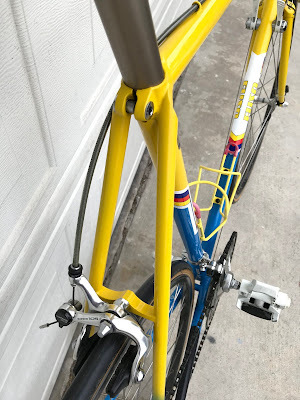 My friend, Jesse had a mint Campagnolo 10-speed groupo that he was willing to part with, so here's the Merlin with the mean, lean Campy setup. 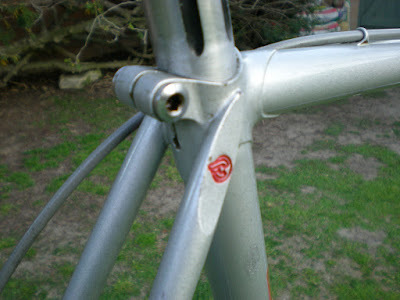 Since these photos were taken, I went ahead and added the Merlin decals to the frame. I think I like it with the decals - more authentic to it's legacy. 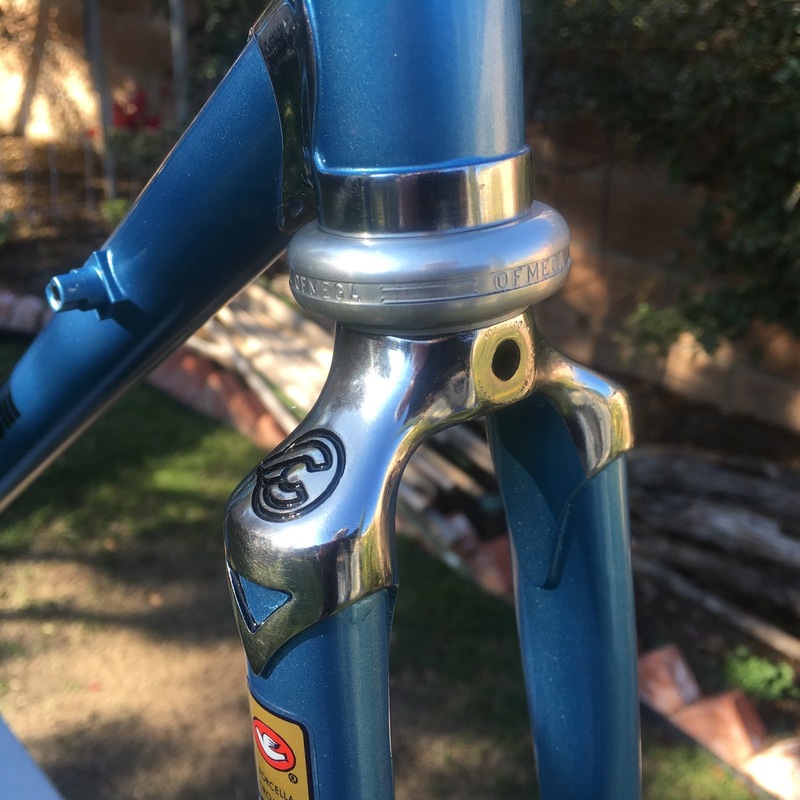 I purchased this 1985 Centurion "Cinelli" Equipe in 2012 and sold it in 2015. The bike fit me fine and rode like a dream, but I needed the money for... another bike, so I sold it. The person I sold it to, in turn, sold it to a fellow Classic and Vintage Bicycle Enthusiast who saw the potential in the Cinelli-built frame and decided to take this bike an entirely different direction. 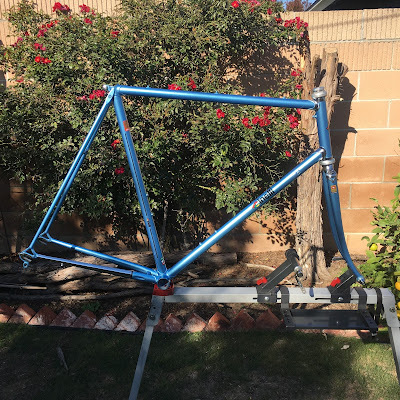 He stripped the frame and took it to Evan at The Bicycle Stand in Long Beach to have their painter respray the frame in a brilliant BMW-Mini Color "Electric Blue Metallic." I found the Centurion again during a random conversation with the current owner who mentioned he had a rare Centurion Equipe. I said, "Oh, I had one of those, but sold it about a year ago." 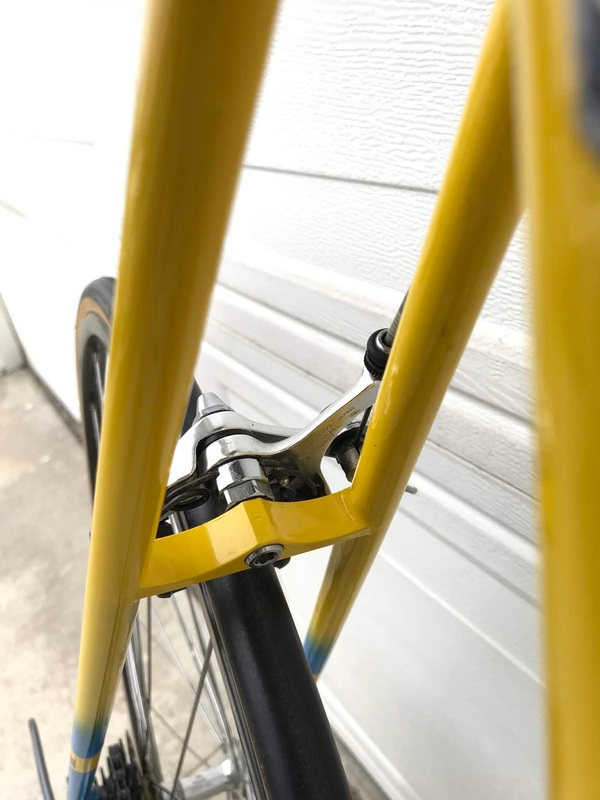 He sent me a couple of photos and I was able to confirm, from touch-up paint and other small details, that it was, indeed, my old bike! 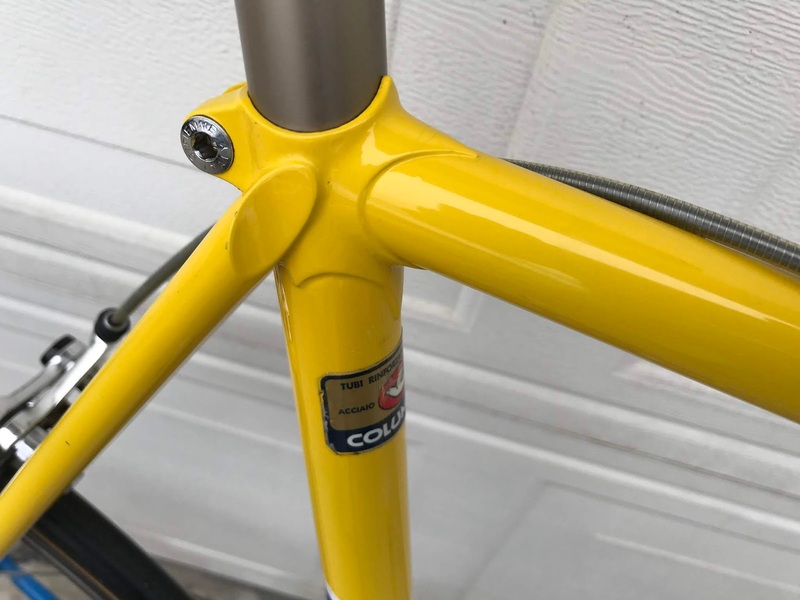 The owner mentioned his plans to leverage the frame's Cinelli legacy and turn it into a one-of-a-kind Cinelli Equipe frame. He chose the color for the frame after driving by a local BMW dealer and seeing a Mini in the lot. The precise paint details are: BMW-Mini Color "Electric Blue Metallic", Mini code 870. 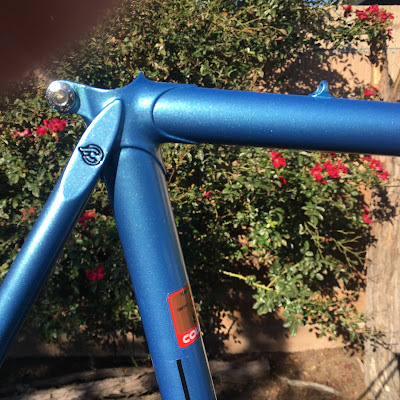 The Cinelli's paint is Matrix Brand, "Performance Basecoat" code MBP-LV-113822. The owner was willing to sell the bike, so we made a deal and I just picked it up this morning. I've got the frame hanging for now until I collect all the C-Record-Era parts for it. I have most, but want them to be as minty as possible. There is one less stock Centurion Equipe in the world. How many are there out there now? Fifty? One hundred? Either way, I feel good about bringing a truly unique bicycle onto the road and having my old friend back home.